These shiny 15 gallon galvanized steel tubs feature a smooth electro-galvanized finish and are constructed with a wire-reinforced rim, body swedges, and an offset bottom. They are rust-resistant and built to last for years of outdoor use. The polished 15 gallon galvanized tub finish is traditionally used indoors to add a bit of delicate rustic flair to your home. 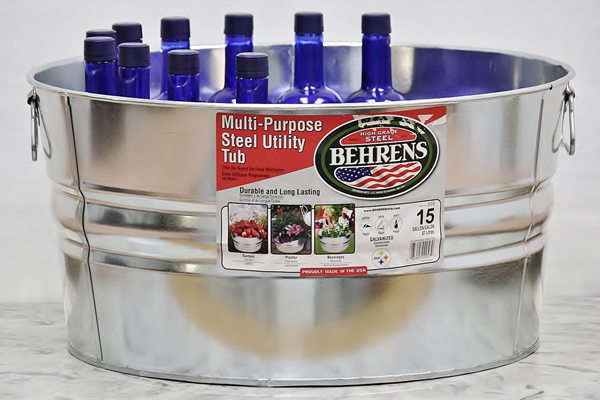 Our big galvanized wash tubs can be used to create beautiful garden planters or to carry weeds, tools, or animal feed around your property. A vintage-inspired large galvanized tub every homestead needs. Use as a galvanized beverage tub and serve up to 49 standard drinks on ice. 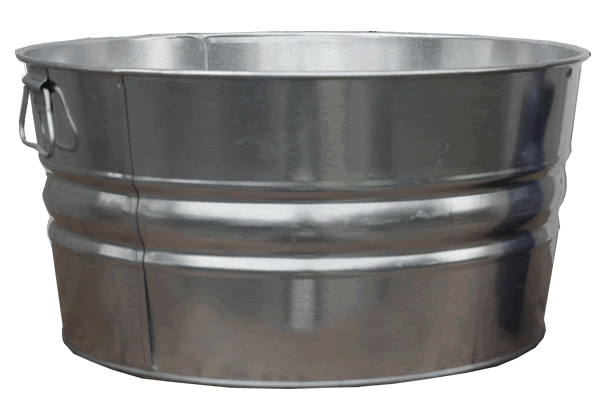 We also offer this round galvanized tub in 17 gallon and 11 gallon sizes. See this 15 gallon round wash tub in the traditional hot-dipped finish.